2019 Chevy Corvette Z06 quick spin review and rating | Car News, Reviews, & Pricing for New & Used Cars. Despite being six model years into its lifecycle, the seventh-generation Chevy Corvette is still going strong. Chevy has rolled out a number of variants with the Corvette ZR1 following the Corvette Grand Sport following the Corvette Z06 which followed the Corvette Stingray (one word for the C7). Each version offers something a little different, from the affordable punch of the base car to the gut churning performance of the ZR1. We feel the right mix of price and performance is somewhere in the middle, though each variant is a winner in its own way. Our test car this week is a Arctic White 2019 Corvette Z06. 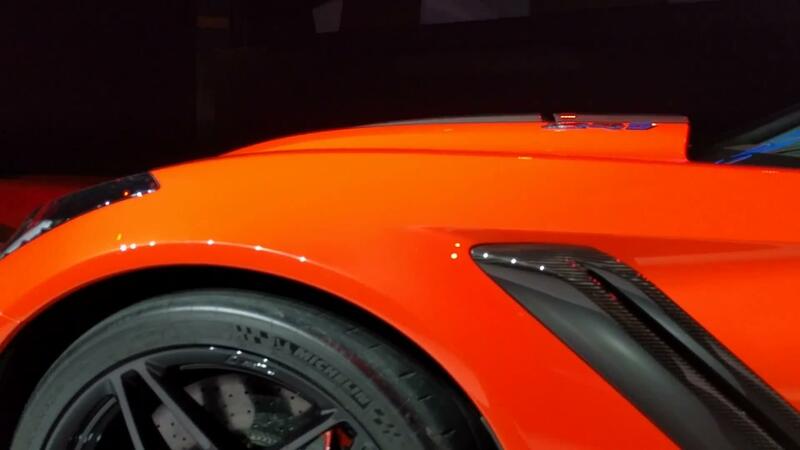 Like all Corvettes, the Z06 uses a 6.2-liter V8. In this case, it’s mounted with a 1.7-liter supercharger, helping the engine crank out 650 horsepower at 6,400 rpm and 650 pound-feet of torque at 3,600 rpm. The car came with an eye-watering $24,525 in options, most important the $7,995 Z07 Ultimate Performance Package. The package adds Brembo ceramic brakes, upgraded suspension and a set of sticky Michelin Pilot Sport Cup 2 summer tires. Other options include $1,995 Competition Seats, carbon fiber trim and the $8,495 3LZ equipment package (upgraded upholstery, heated mirrors, heated and ventilated seats and more). All in, this Z06 cost $105,115. Editor-in-Chief Greg Migliore: Love the rawness and severity of this thing. The Z06 is the answer for track-hungry enthusiasts who can live with the daily comprises of driving an instrument this blunt. That being said, it’s not that unyielding around town. You can see pretty well out of it and the seats are comfortable considering they were designed for sporting purposes. Dynamically, the Z06 enlivens the senses. The steering is satisfying and connected, the brakes are appropriately grabby and the suspension is taut and abusive on some roads. That’s fine — it’s really tuned for Road America or VIR. The supercharged engine is a riot. It’s way more power than you need for daily endeavors, but it positions the Z06 to compete with the best of Europe’s exotics. That’s really what this ‘roided-up Vette is: an exotic supercar that happens to have its engine in front and a Chevy badge. And it’s pretty awesome. Managing Editor Greg Rasa: Long ago, when I proudly wore the uniform of Mr. Goodwrench, I drove literally hundreds of Corvettes — C3s, which were current at the time, but C1s and C2s as well. Until this Z06, I hadn’t been in a modern Corvette in a year or two. It’s fascinating how much Corvettes have changed over the decades — not the least of which is the Z06’s 650 horsepower and 650 pound-feet of torque, which avenge the emasculation of those Vettes of the ’70s. You wouldn’t say old Vettes were luxurious, but this one rather is. And where once you might’ve stepped over side pipes to climb out, now you’re stepping over carbon-fiber side skirts. More fascinating is how this machine, though supremely powerful and modern, still contains familiar echoes. The seating position, the view over the fender swells, the smell of fiberglass construction, the feeling that you’re in a Gemini space capsule — the cockpit remains snug as ever, and I instinctively did what was routine when hopping in one so long ago: opening the windows to relieve my sense of claustrophobia. The roof on this thing would have to be off all the time to keep that feeling tamped down; fortunately, it’s light as a feather and makes the coupe a better choice than the convertible. Driving down public roads, you can’t realize the full capabilities the Z06 holds in reserve, but you know they’re there. And like its forefathers, it looks great. It’s modernity wrapped in tradition. You feel like an American driving it. The Corvette is a fun car to drive, though. For my money, I’d go with the lower-powered Stingray. $55,000 for a Vette feels like kind of a bargain. Sure it’s only (heh) 455 horsepower, but that’s easily enough to have plenty of fun on public roads. The thing is, I probably wouldn’t buy a Corvette in the first place. It’s too uncomfortable and claustrophobic, and in both Vettes I’ve driven recently, I’ve had a terrible experience trying to use the infotainment system (pairing issues, unresponsive to touch, and the like). It’s great to drive for a couple days, but I’m happy enough not to live with it. Associate Editor Reese Counts: There’s little else I can say about the Corvette that I didn’t say in the last batch of drivers’ notes. It’s a wonderful machine that represents everything I enjoy about cars. I literally grew up in and around Corvettes. The first car I really wrenched on was a Corvette. The first car I ever drove was a Corvette. It’s such an unapologetically American machine. It’s loud, brash and packs more wallop for the price than nearly any other car on the market. I dig the ‘Vette’s killer styling and deep, hairy-chested soundtrack. The Z06 isn’t the car I would choose — I prefer the balance of the Grand Sport — but the fact that you can get a 650 horsepower supercharged performance coupe for $80,000 (before options) is crazy. I love my dog. So here’s a photo of both.